The Little Partners Learning Tower will probably be useful only for parents, but, it is so good at what it does, that I think everyone should know about it. 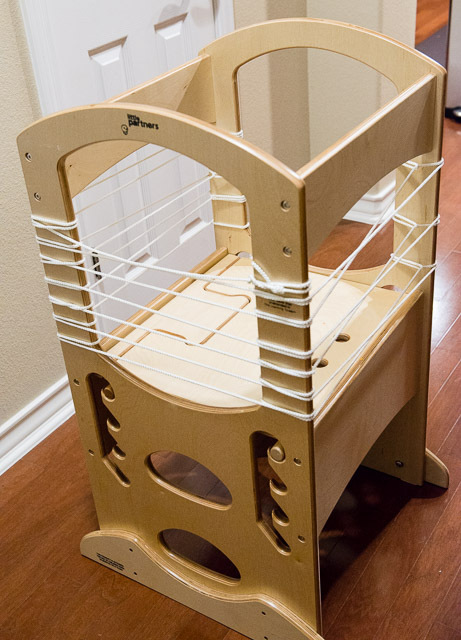 If you don't have young kids, but, you know someone who does, this might be the ultimate gift that will be used for years to come. The Learning Tower is an adjustable raised platform designed to allow children from 1.5 years to 6 years to stand on and be able to be tall enough to reach the kitchen counter (or, when Emma was younger, allow her to see what was on the counter). 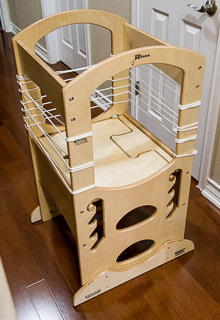 When my wife, Tina, ordered the Learning Tower, I was skeptical at first. I knew I wanted to teach my daughter how to cook, but I didn't think starting when she wasn't even two made any sense. How much help could she be? Wouldn't she just get in the way? She'll just be able to reach everything on the counter and mess things up! I quickly learned that I was completely wrong. What I found was that when we didn't have the Learning Tower, Emma would pester us to pick her up so she could see what we were doing. If we were preparing vegetables, she'd want to see what we were washing and what were were cutting. Then when we started cooking, she would want to see what we were stirring and what was in the pot. Often, I would find myself holding her on my hip with one arm and stirring the pot with the other. With the Learning Tower, the kitchen quieted back down (no more "what you doing? ", "hold me", and "let me see" on repeat) and she could and would watch us cook. 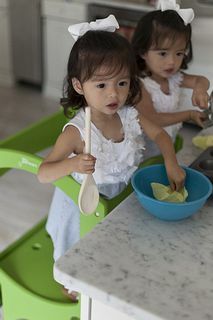 Sometimes, should would bring over a little toy pot, wooden spoon, and some dried beans to stir while watching us cook so she'd be "cooking" too. I don't know how much I can stress how incredible it is to have something that will stop the whining about being included in cooking (showing a video or other "screen time" activity works too, but she already gets ample "screen time"). It frees up both of your hands as well as your body (so I can move between the prep area and the stove without worrying about where Emma is). 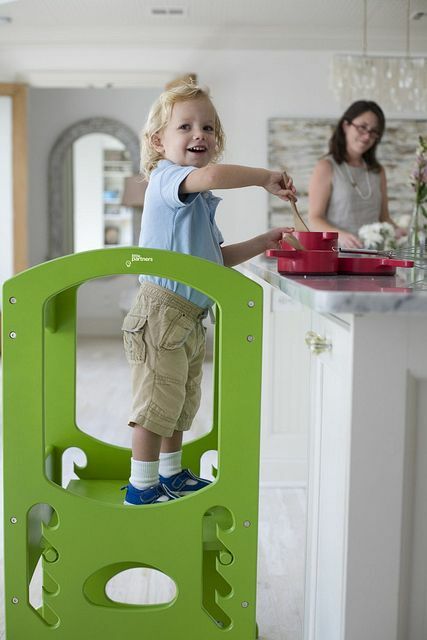 It also allows her to be at the right height to "help" and makes cooking a fun family activity instead of one where the toddler is banished from because it's too messy or dangerous. The Learning Tower was easy to assemble, but heavier than we expected. 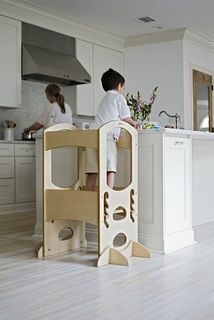 It's about 35 pounds, which makes sense given that it is solid wood and tested to hold up to 500 pounds on the platform (according to Little Helpers, the manufacturer. Amazon's description says 250 pounds). Because of how heavy it is and how bulky it was, initially we did not use it often. However, the more we used it, the more it became clear how much Emma enjoyed being in it and being a part of the action (even those times when she was just watching and not pretending to or playing at prepping food). On two sides of the Tower are footholds which a child can use to climb up into the platform like a ladder. On those sides, the hole to enter the Tower is relatively large to provide enough clearance that they don't hit their heads. One thing we discovered quickly was that although the size of the openings make sense for older children, for extremely young kids they might fall out once they are in (imagine a small toddler sitting down and leaning back). So, to make sure that wasn't a problem, I tied a clothesline tightly around all four sides (looping around each corner post on each pass) until I had a little fence of clothesline acting as a barrier on all four sides. Since Emma wasn't old enough to climb in, this worked perfectly when I lowered her into the Tower from the top. I was concerned that she might try to climb out or get tangled in the clothesline, but was comfortable with the setup since I knew she would only be in it while we were nearby. She never tried to climb it, so that worked out just fine. Now that Emma is older (almost three years old! ), she wants to climb in by herself (and be able to get out and get one of her kitchen toys and return by herself), so I redid the clothesline barrier to block three sides. 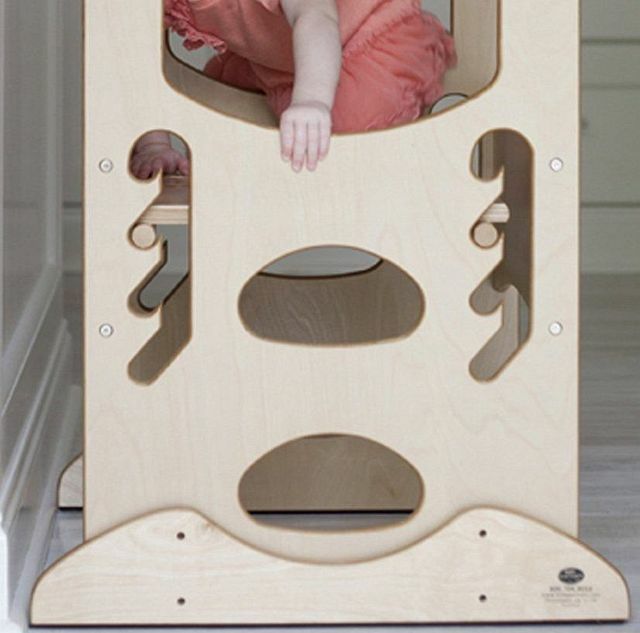 Emma is pretty small, so she finds using the built-in ladder a little troublesome, but solved that problem by running off to her playroom, grabbing her step stool, and carrying it back to the Tower so she can climb in and out with ease. 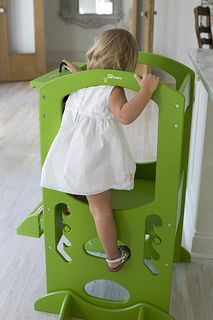 As I mentioned earlier, the Learning Tower can hold a great deal of weight, but it is also easily adjustable. We have ours at the highest setting, but as your child grows you can lower the platform until they no longer need the vertical assistance. 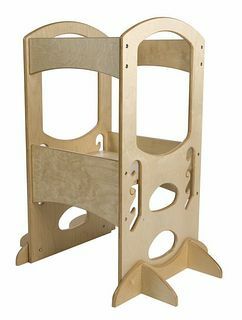 The Learning Tower comes in a variety of colors including several traditional wood finishes as well as red and apple green which should match or compliment any home. We have a "natural" color... I think because it was on sale. The build quality on the Tower is excellent. It was sanded smooth and the finish is easy to wipe clean with a damp cloth. I ran my fingers along every opening and groove and do not worry at all if Emma will get a splinter or "ouchy" from using the Learning Tower. 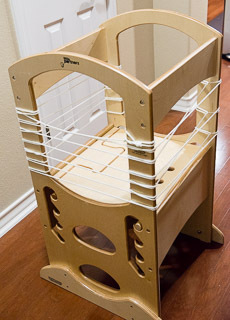 Amazon.com is where we bought our Learning Tower and at the time of this post, they have 509 reviews with an average of 4.8 stars which makes it one of their top rated products in both Kitchen and in Baby/Children categories. 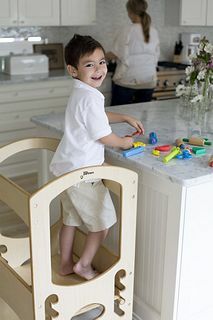 It is definitely the top rated kitchen step stool they have for sale. Be the first to comment on Little Partners Learning Tower!